A high build gloss/eggshell, chlorinated rubber based finish. Highly resistant to chemicals and oils. Gives good weathering properties when used as the finish coat in a protective paint system. Steel and non-ferrous metals which are properly prepared and primed. Previous suitable coat – dry, clean and abraded. 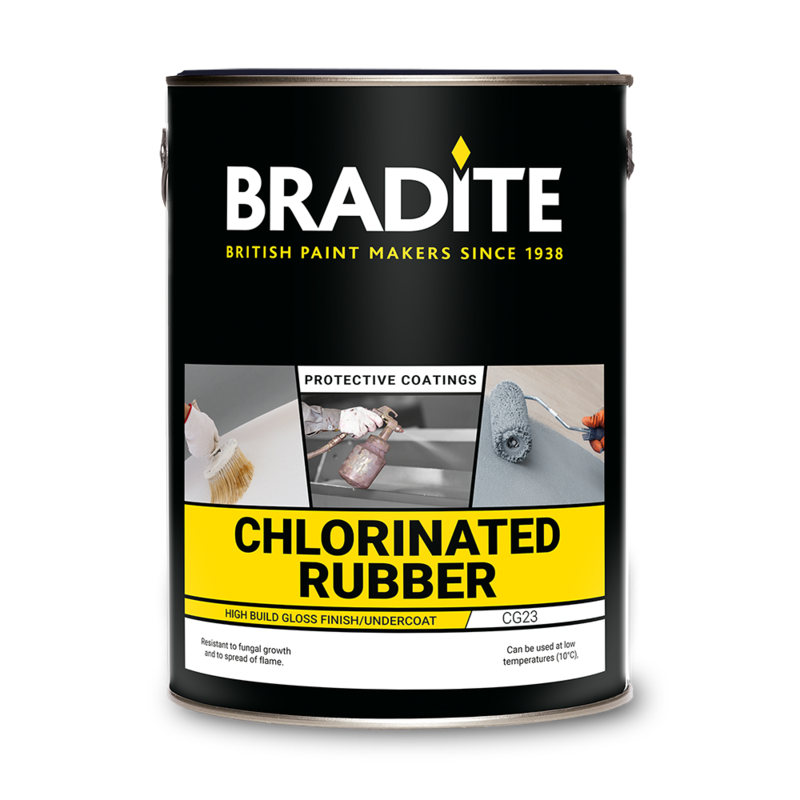 Correct preparation is vital to ensure you obtain the full benefit from Bradite Metal Paints. High pressure water cleaning to remove all loose salts and other contaminants. Degrease using BRADITE TD39, with scrubbing plus high pressure water cleaning to remove any oil contamination not removed by high pressure cleaning alone, rinse with clean water and allow to dry. Mechanically or manually prepared steel to a clean metallic finish, SIS-St 3 minimum. Substrate to be dry, clean and free of contamination and dust free prior to coating. Jet wash to remove all loose and flaking paint, salts and other contaminants. Degrease using Bradite TD39 diluted with up to 9 parts of warm water and scrubbing to remove any oil contamination not removed with jet washing alone. Rinse with clean water and allow to dry. Existing coatings should be well adhered with all edges tight and well feathered. Bare or rusted steel should be manually or mechanically abraded to a clean metallic finish (SIS-St 3). Substrate should be clean, dust free and dry before application. Spot prime with correct primer. Galvanised steel, aluminium and other non-ferrous metals should be roughened or lightly abraded. New bright galvanised steel should be degreased and treated with Bradite TM38 pre-treatment for galvanised steel.